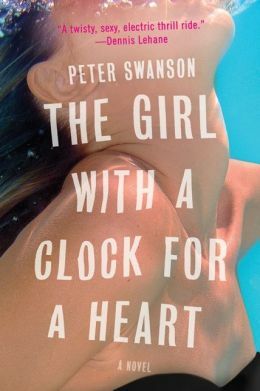 THE GIRL WITH A CLOCK FOR A HEART features one of the most inept protagonists ever to headline a thriller. Okay, maybe that’s a little harsh, but George Foss is frustratingly passive hero, who continuously reacts to circumstances rather than take action of his own accord. It makes him a more realistic character, sure – in his circumstances, I’d probably want to wrap myself in a blanket and descend into blissful slumber too – but a lack of verve makes George a less endearing character than those the majority of those who populate the genre. If I ever find myself framed for murder, George ranks at the bottom of my list of people I’d call for help. But George’s incompetence is essential to the narrative. Peter Swanson pains his protagonist as a middle-aged bachelor, discontented with the direction his life has taken him, but lacking the drive to do anything about it. The one exclamation on his otherwise wearisome existence was his college romance over two decades ago, which ended with the girl’s disappearance – in heavily convoluted circumstances that I won’t spoil here – and subsequent years spent pining over her memory. Then, one day, she returns to his life, alive and well, but in danger, and in need of a favour. She needs George to deliver an excessive amount of cash to the man she stole it from. And of course, George agrees to it, which underlines his inability to make deliberated decisions and sheer cluelessness, and instigates a series of events that results in plenty of murder and mayhem. The plot shifts between George’s college years and the present day, flicking between the two seamlessly. Regular thriller readers will be comforted by the regular plot twists and chapter-ending climaxes they’ve come to expect, though there are few genuinely shocking twists that force an intake of breath. Swanson plots his tale meticulously and his prose is confident and clean, but George is rarely more than a passenger struggling to stay afloat in a serious of dramatic events. I respect Swanson’s decision to put the spotlight on an everyman, but a stronger frontman might have benefitted the novel overall. We’ll never know. THE GIRL WITH A CLOCK FOR A HEART is a stunningly swift read. Fun while it lasts, it is not a debut I’ll be lauding over for years to come, but it cements Swanson as a new name in the genre who is certainly worth keeping an eye on.